Last night, I was having a conversation with all of you great folks on our Facebook page about comfort food. 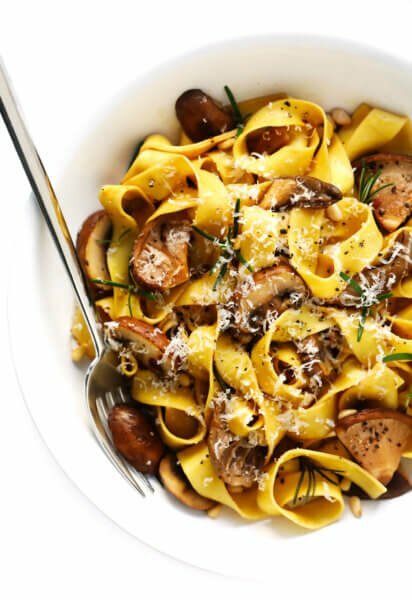 From pizzas, to salads, to pot roast, to cheesecake, to chocolate, and on and on, it sounds like there is a heck of a lot of great food out there that makes you all oh-so-comforted. But can you guess what the most popular food group was? Oh yes — pasta. You all LOVE your pasta! I’m right with you. I’ve always said that my favorite comfort food is a three way tie between pasta, enchiladas, and egg drop soup. So when I was dreaming up new recipes recently, I had the idea to see what it would be like to combine them. Ok, not the egg drop soup, it stands — and probably should aways stand — alone. 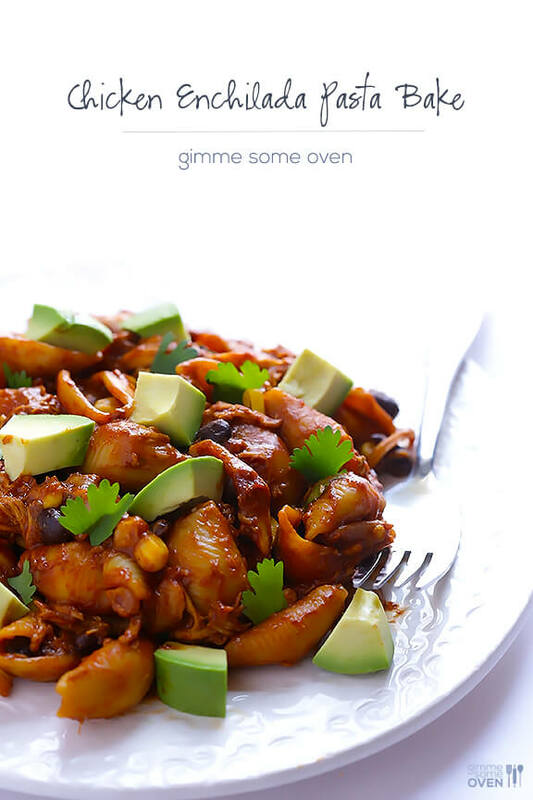 ;) But the idea of an enchilada pasta sounded tasty! So this past weekend, I made a double batch of my favorite homemade red enchilada sauce. 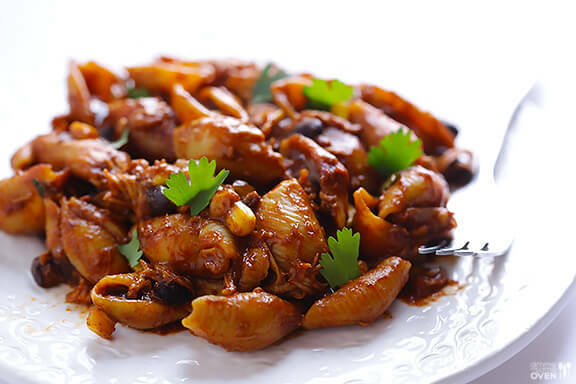 And then instead of turning it into chicken enchiladas, I took most of my normal enchilada ingredients and tossed them together with some shells to make chicken enchilada pasta! But since it’s winter and casserole season, I decided to pop it in the oven with some extra cheese and make a chicken enchilada pasta bake. Best idea of my week. 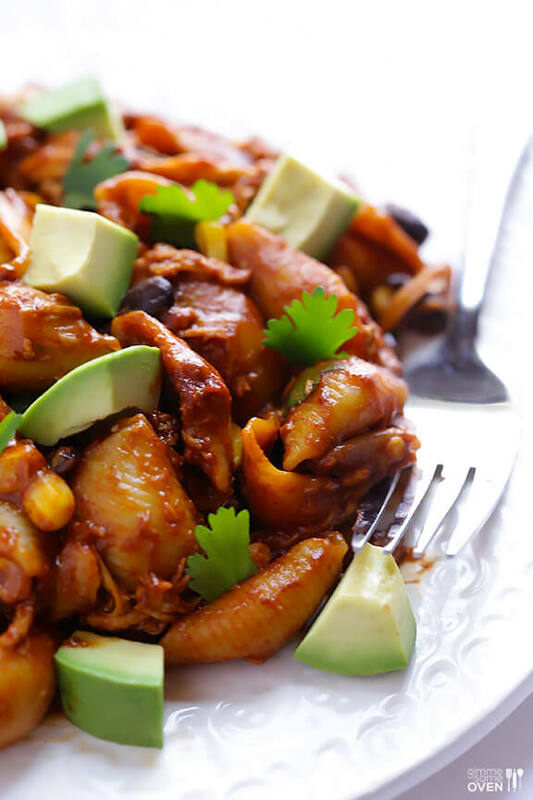 I was a little worried that I would be weirded out by the idea of all of my favorite enchilada ingredients in a pasta, but it tasted like the most natural thing in the world! The sauce was flavorful and awesome, as always. 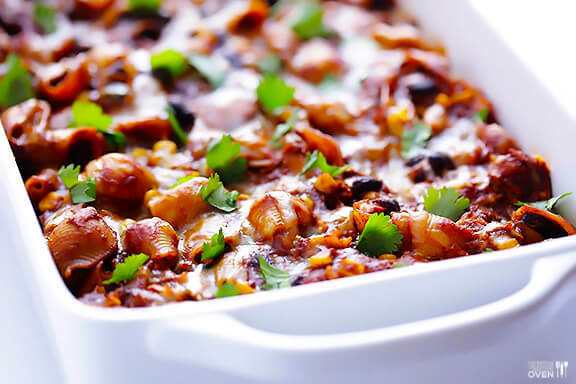 And when tossed with some shredded chicken, corn, black beans, onions and chiles, it tasted just like my favorite chicken enchiladas. But I loved getting to enjoy it with some nice, chewy, pasta al dente! But while I went for my classic chicken enchilada ingredients, you could totally sub in whatever you love. Not a chicken-eater? Nix it and add in some more black beans! Not a fan of black beans and corn? Feel free to add in some roasted veggies! Want some extra kick? Saute in some jalapeno or serrano peppers with your onions. 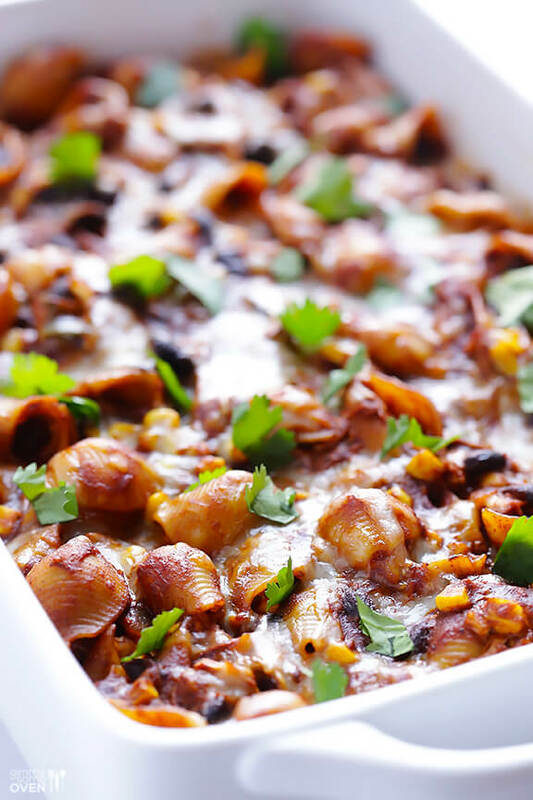 The best of chicken enchiladas and pasta come together for this great new comfort food — Chicken Enchilada Pasta Bake! Cook pasta in generously-salted boiling water until al dente according to package instructions. Meanwhile, heat oil in a large skillet over medium-high heat. Add onion and saute for 5 minutes, stirring occasionally, until onion is translucent. Add green chiles and saute for an additional 2 minutes. 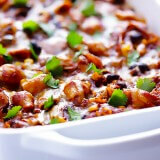 Add enchilada sauce, shredded chicken, black beans, and corn, and stir to combine. When the pasta reaches al dente, drain and remove from heat. Add the enchilada sauce mixture to the pasta, and stir to combine. Stir in 2 cups cheese until just combined, then transfer the pasta to a 9×13-inch greased baking dish. Sprinkle pasta with the remaining 1/2 cup cheese. Bake for 15 minutes, or until cheese is melted and the mixture is warmed through. Serve immediately with optional toppings. Who on earth could not love this!? 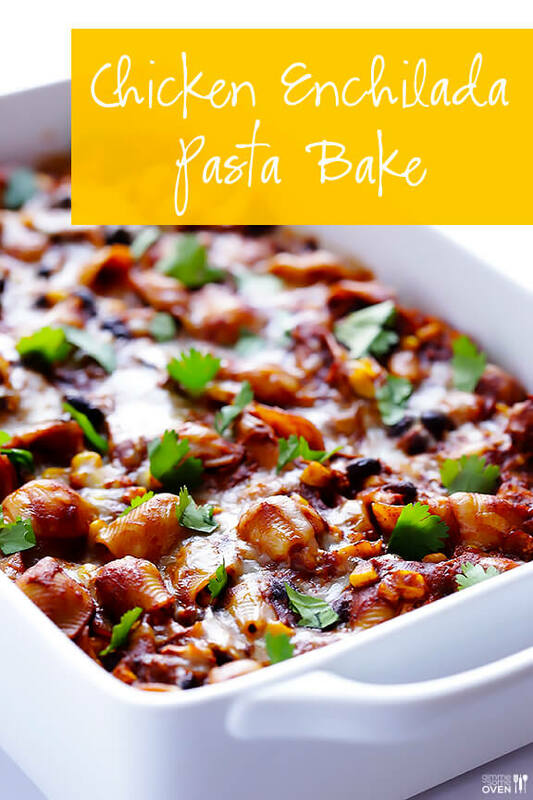 It’s enchiladas, it’s cheesy pasta, it’s baked and it’s just total comfort food! Such an awesome dish, Ali! Sounds like your readers really know what is up in the comfort food department! Best idea ever! This really is a winner. I looooooove pasta and enchiladas! This looks amazing! I’m more of a pasta girl than a tortilla girl, so these “enchiladas” are right up my alley!! This looks amazing! I think my family will love it. Call me crazy, but I’m going to throw all the ingredients into my slow cooker and see how it comes out. Thanks, Ali! There are so many reasons to love this dish!!! 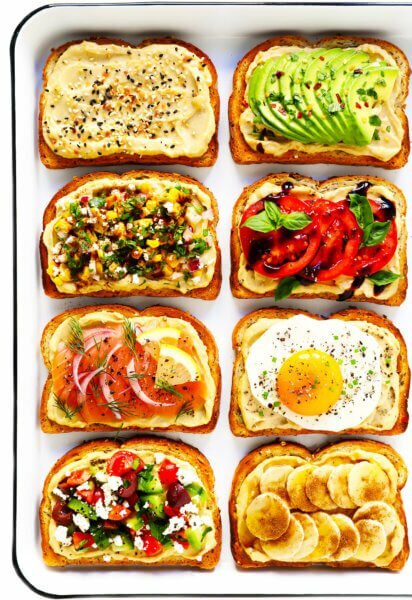 I am craving this now from the pictures – YUM! 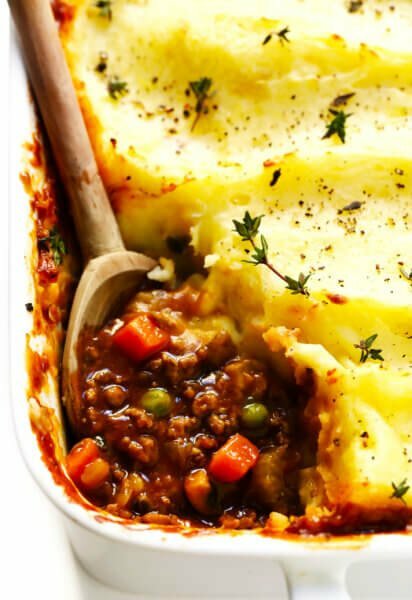 I am craving comfort food and this bake looks perfect! Good god. Get in my mouth! My kids would go bonkers for this! Wow the photos are absolutely stunning!!! Delic! Definitely some great comfort food! I need a big bowl right now!! 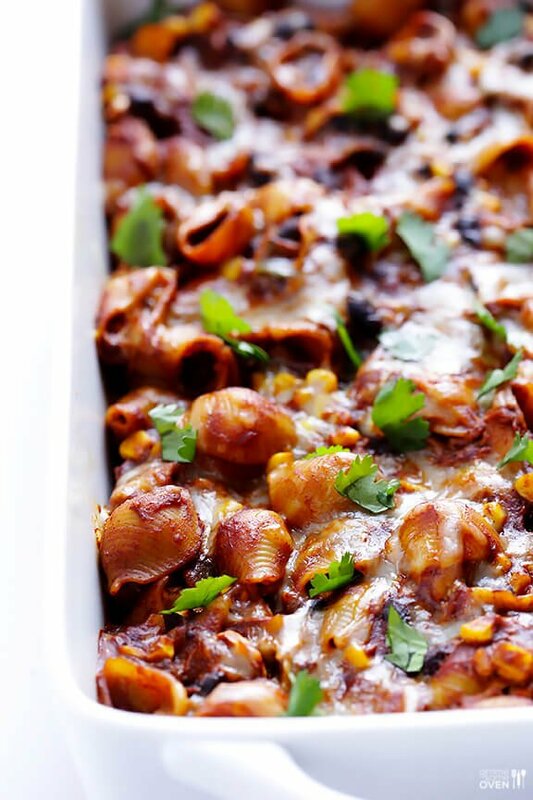 Enchiladas in oh-so-cheesy pasta form? YES! I just added this to our menu for next week – Jason is going to be so thrilled! Sounds and looks delicious – totally going to try this! Just had to tell you that I made this last night and it was amazing. It had a nice mild kick to it and oh the cheese! Can’t wait to heat up for leftovers tonight.